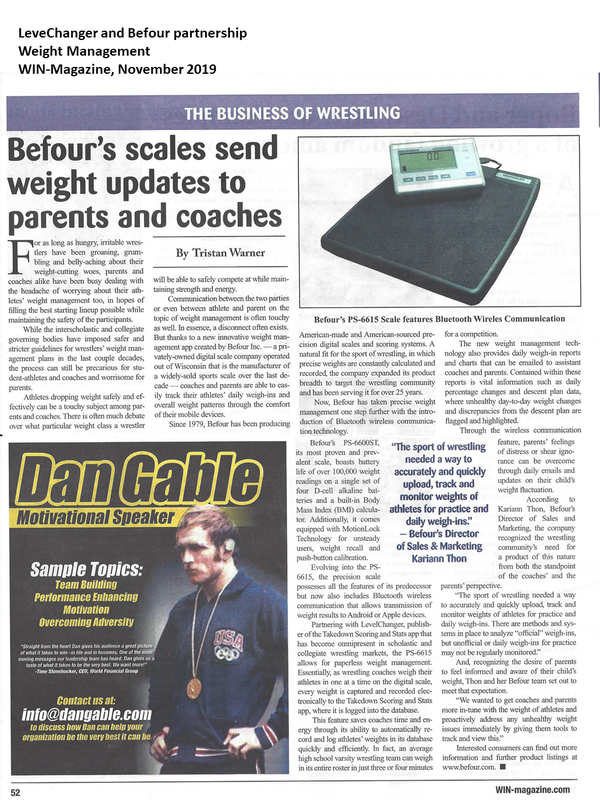 NEW Opti-PED Pediatric Scale & Infantometer from Befour, Inc.
Saukville, WI (March 2019) - Befour, Inc. producer of precision digital scales, introduces the first NEW pediatric exam station design in over 25 years – Opti-PED. Using optic technology, this Pediatric Exam Device delivers both digital weight and length - all while providing unsurpassed safety, accuracy and capacity. With 10 gram weight / 1mm length accuracy and 27kg (60 pound) capacity, Opti-PED handles all pediatric needs, from neonates to the largest toddlers. after the infant is removed from Opti-PED. infant access for examinations. Opti-PED ships fully assembled and ready to use. Opti-PED is available as a stand-alone device or with an optional stainless steel table, which include storage drawers. For mobility, optional locking casters can be added to the table. Befour is a privately-owned, ISO 13485-certified company, designing and manufacturing American-made, precision digital scales since 1979. For 40 years, Befour, Inc. has produced equipment which incorporates cutting edge technology, superior quality and personalized customer service. For more information about the full line of products, including this featured product, visit www.befour.com. to see our scales in action on TV. weight loss journeys of individuals that weigh 600 to 750 pounds. ruggedness, backed by the industry-leading 3 year warranty. a briefcase-style carrying handle. And we have many, many other scales with a 750 or 1,000 pound weight capacity. Our trained scale experts welcome the opportunity to discuss your particular needs to determine the best scale for your facility. Give us a call. White Plains, New York (February 8, 2017) – Befour, Inc., the Wisconsin-based manufacturer of professional medical scales, has appointed Dorian Drake International as its export management company for Latin America and the Caribbean. Under the new agreement, Dorian Drake will manage all export functions in its territory, with special focus on building brand recognition and distribution for the Befour brand of professional scales. Based in White Plains, N.Y., Dorian Drake International is an export management company that manages international sales, marketing, customer service, traffic, credit and collections for manufacturers selling in markets outside the United States. The firm staffs stand-alone sales teams in five distinct industries: automotive; foodservice equipment; hardware and lawn & garden; industrial and environmental, and medical. To learn more, go to doriandrake.com. the wrong weight. And this is also true for all old-fashion “balance beam” scales. Befour avoids CSBI by utilizing a superior four load cell design with a generous platform size and the column mounted directly to the weighing surface. Accurate weight is guaranteed, even when the belly is touching the column. to the left, to see if the scale has CSBI. If you are planning on using batteries to power your scale, pay careful attention to the size of battery used (AA, C, or D-cell) as it is a key factor in the total cost of the scale over its lifespan. For example, one popular brand of scales uses six AA-cell alkaline batteries that provide “25 hours of continuous use”. With a one minute turn-off, this means one can expect only 1,500 weighings per set of batteries. Viewing this another way, you will need over 65 sets of batteries (390 batteries) per 100,000 weighing measurements! Factor in the cost of time to change the batteries and you are looking at well over $500 in battery costs per 100k weighings – a huge portion of the life cycle cost of the scale. In contrast, Befour’s new CX7 console features our exclusive ECO Weigh, the most efficient battery system on the market, which provides an astounding 100,000+ weighings on four D cell alkaline flash light batteries. We include the first set with your scale, so you are “good to go”. lower than the AA-cell powered scales. “best bang for the buck”. • The measurement span of 38” to 88” is over 35% greater than other units on the market. This means the chance that the person is too short or too tall to be measured is greatly minimized. • The folding headpiece rotates a full 360 degrees, allowing it to be pointed away from the subject while being raised to the horizontal position. Compare this to other height rods that have a headpiece that is in a fixed direction, pointing toward the subject. This means the headpiece must be raised well above the subject’s head before unfolding to the horizontal position - awkward or impossible when the subject is tall. • Our electrical cables are hidden from sight, being routed internally. This makes for a neater appearance and safer operation. • Automatic height lock-in: Holding the headpiece stationary for two seconds will lock the height measurement on the display. If you wish to re-measure height, simply press the HEIGHT button within five seconds to unlock.